Tube or not tube? 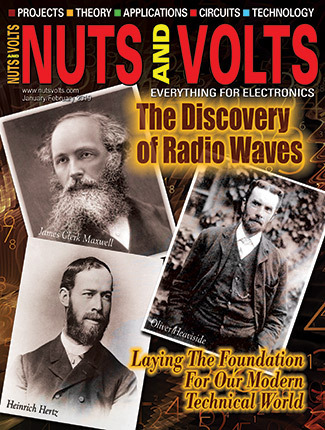 Hams are still on the best of terms with “hollow state” electronics! 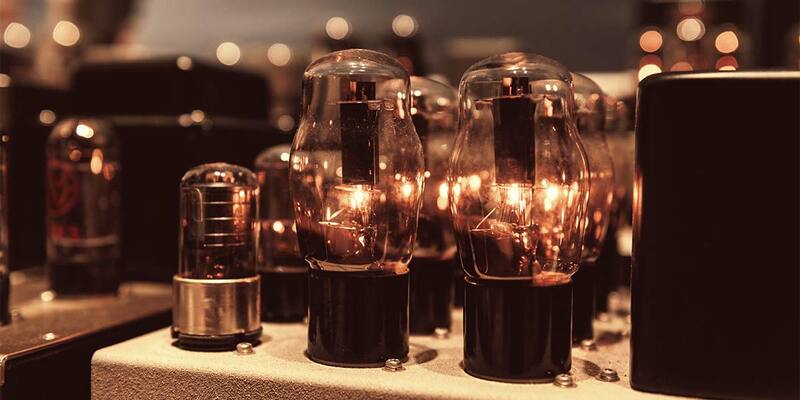 You might think the vacuum tube has burned itself out of electronics, but its filaments are still burning brightly in certain quarters. The very first electronic device capable of amplifying a signal — the vacuum tube or “valve” as it is known in the United Kingdom — was invented by John Ambrose Fleming (1905) and then enhanced by Lee de Forest (1906) during some heady years in physics. Each tube has at least two elements: the cathode from which the electrons are emitted; and the anode or plate to which the electrons travel. A positive voltage is applied from the cathode to the plate so that the negatively-charged electrons move from one to the other. This is electronic current as opposed to conventional current which you are probably more familiar with. (See the sidebar about the difference between the two.) The cathode itself can be heated by an electric current through a filament like a light bulb or indirectly heated by a nearby filament. 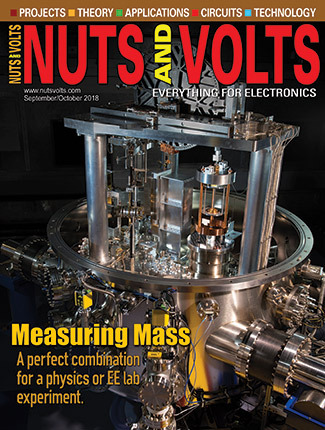 A positive voltage accelerates the electrons toward the grid but most miss its tiny wires and reach the anode, creating plate current, IP, through the tube. A negative voltage repels the electrons, reducing plate current; perhaps all the way to zero or cutoff if the voltage is high enough. 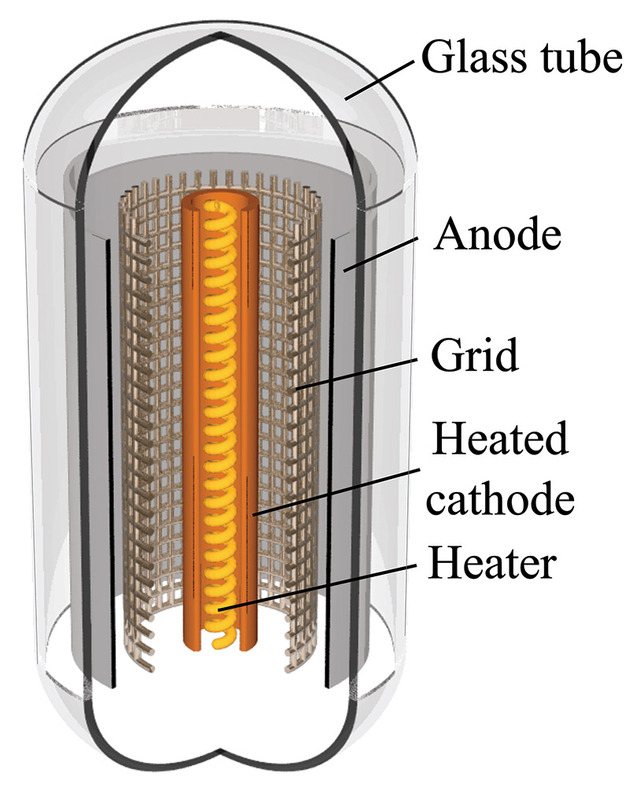 Figure 1 shows a cutaway view of a triode with an indirectly heated cathode. FIGURE 1. A cutaway drawing of a triode tube showing the filament heating the cathode, which is the source of electrons. 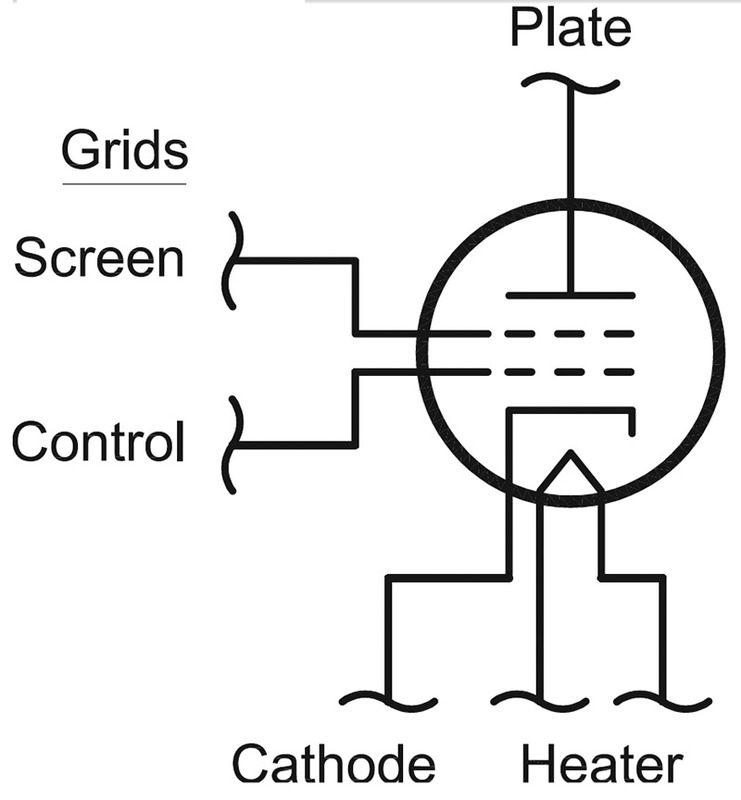 The control grid surrounds the cathode and the electrons must pass through it on the way to the anode or plate. In a tetrode or pentode, there are additional grids between the control grid and the plate. Many years ago, during the early years of electrical experimentation, the assumption was made that electrical current was the flow of positive charges. A polarity had to be assumed and there were just two choices. Unfortunately for engineering and physics students, the wrong one was chosen as current in circuits is really the flow of negatively-charged electrons. (This mistake is often attributed to Ben Franklin, but there were others who guessed wrong too.) Electronics generally uses conventional current which flows from positive to negative voltages. Thus, electronic people think of current somewhat differently than physicists, and this causes no end of confusion — particularly with the direction of magnetic fields created by electric current. (See the Wikipedia entries for right-hand rule and left-hand rule for an illustration.) Nevertheless, conventional and electronic current are equivalent except for the assumed polarity of the charge-carrying particles. Each of the characteristic curves on the graph in Figure 3 shows the behavior of IP at different grid voltages. FIGURE 3. Characteristic curves for a 6L6 vacuum tube. 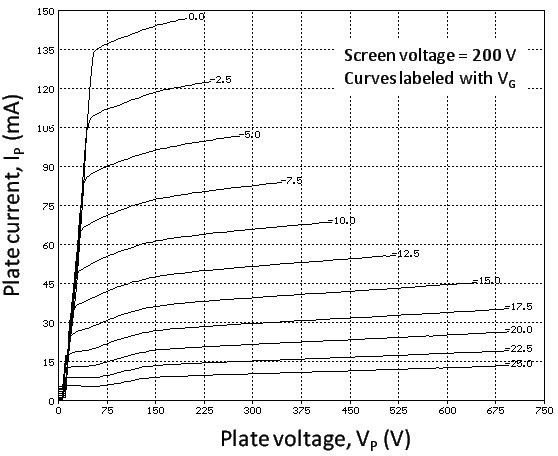 Each individual curve shows the plate current versus plate-to-cathode voltage for one value of the grid-to-cathode voltage. This tube is commonly used in audio amplifiers. The top curve shows that with VG = 0, there is plate current. As VG becomes more negative, the current curves flatten out at lower values of IP. This creates a linear region in which a change in VG (such as from an audio or RF input signal) creates an equivalent but larger change in IP. Thus, we have an amplifier. 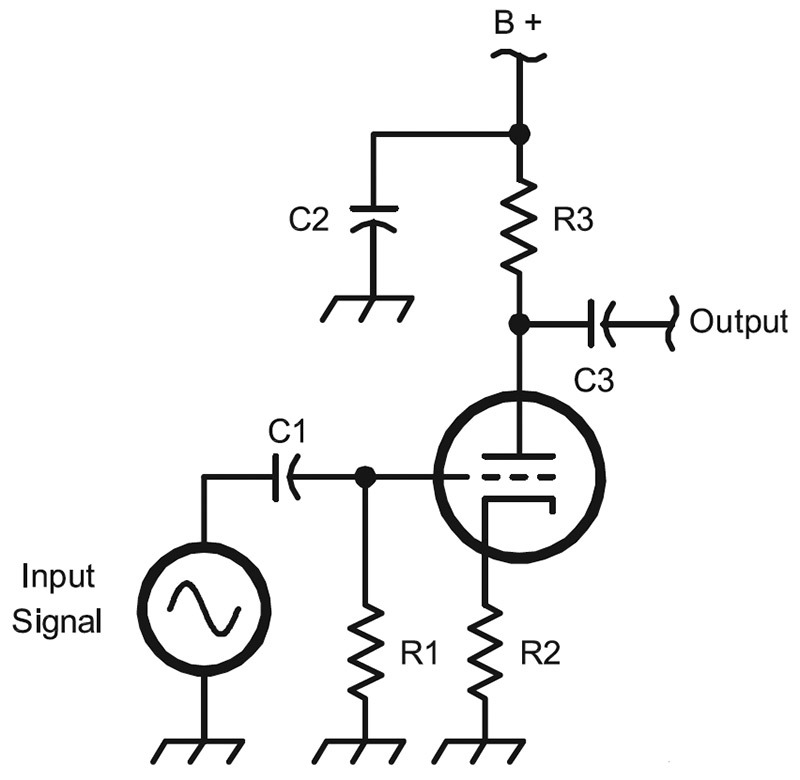 The basic circuit for a triode amplifier is shown in Figure 4. The gain — μ or mu — of the tube depends on the circuit. For the triode circuit in Figure 4, μ = –gm / RP. The minus sign indicates that the output waveform is inverted. That is, when input voltage increases causing an increase in IP, the output voltage drops because of the higher current flowing through the plate resistor, R3. 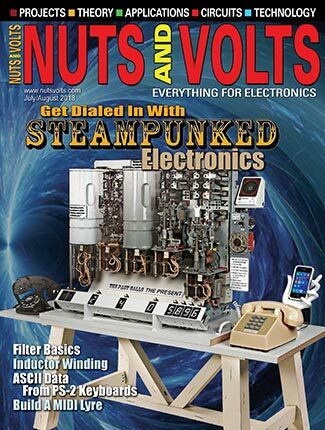 If you like the looks of these projects, there are plenty of amplifier and suitable power supply projects in the pages of the ARRL Handbook starting with editions from the 1950s. There is lots of tube theory and design information in those old books. If you can find a copy of the RCA Transmitting Tubes manual, that too is a great source of information. 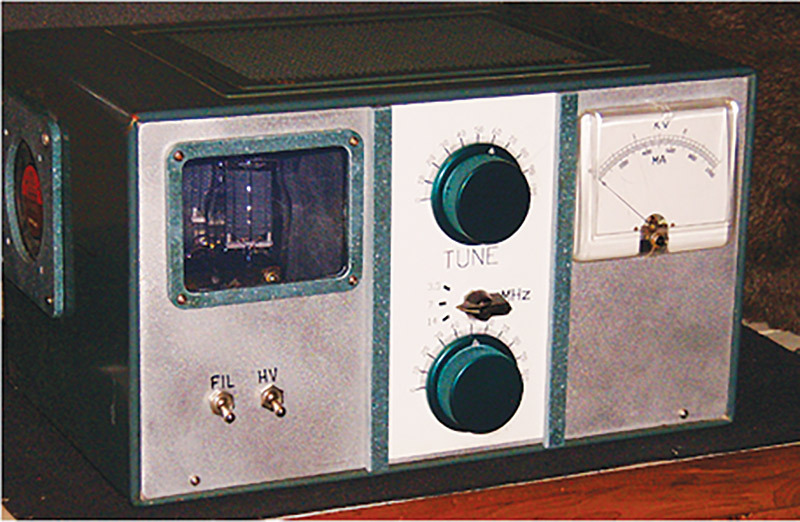 The ARRL’s “Building Equipment” page (www.arrl.org/building-equipment) is also a wealth of information, projects, design tutorials, and links to websites about tubes — good stuff! If you want to start talking about really high power at really high frequencies, there are a couple of vacuum tubes you should really meet: the klystron and the magnetron. In fact, you probably have a small example of a magnetron heating your dinner in the kitchen. 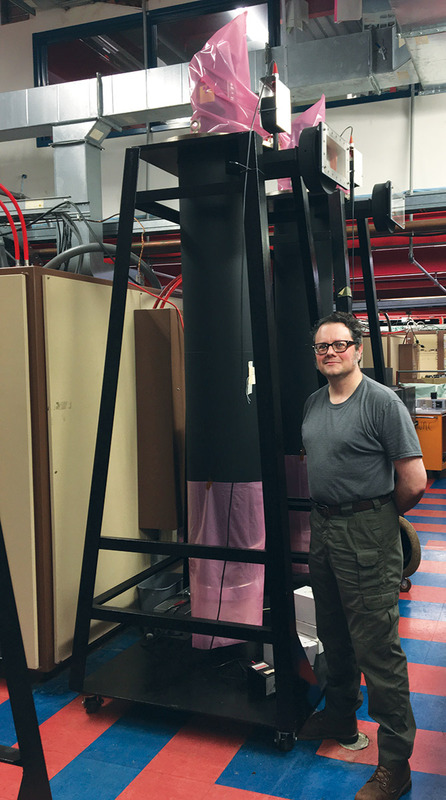 However, that’s a little tube compared to the really big ones in use at broadcast TV stations and particle accelerators, to name two places they are found. The klystron (en.wikipedia.org/wiki/Klystron) in its most basic form shoots an electron beam from a cathode through a resonant cavity. Microwave RF input into the initial cavity causes the beam to accelerate and decelerate. This, in turn, causes the electrons to form groups, which is why this cavity is called the “buncher.” The groups of electrons continue to travel or “drift” through a tube in which the grouping gets stronger. At the other end of the tube is a second resonant cavity that extracts energy from the beam as RF at a frequency determined by the beam’s velocity and size of the groups. Figure 7 shows a high power klystron in use at the Fermilab accelerator in Batavia, IL. Top to bottom, the water-cooled tube is about 12 feet high! 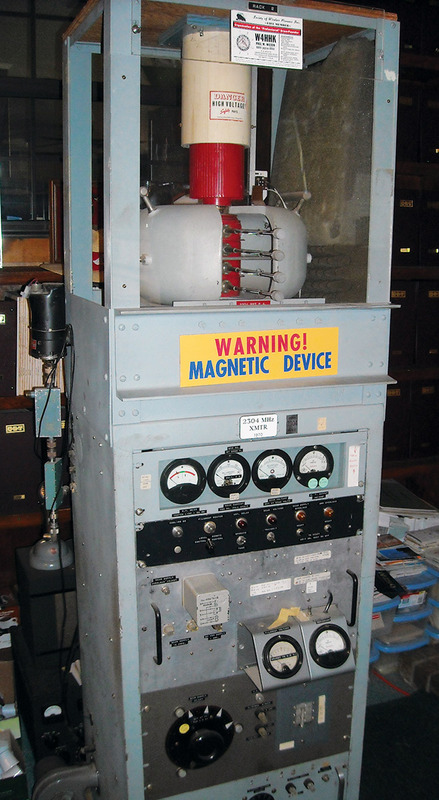 Cousin to the klystron, the magnetron also uses a resonant cavity to excite electrons at microwave frequencies. The magnetron is strictly an oscillator, however. It can’t amplify signals. The magnetron (en.wikipedia.org/wiki/Cavity_magnetron) consists of a circular hole through a block of metal which acts as the tube’s anode. The cathode is in the middle of this hole. The hole is surrounded by resonant chambers formed in the block of metal, which is usually copper. A strong field from permanent magnets causes the electrons from the cathode — which is at a high negative DC voltage compared to the grounded anode — to take a semi-circular path. The radiation from the electrons excites current flow in the resonant cavities, creating a strong RF field. The RF is extracted from the cavities by coupling loops where it is used to create a radar pulse or to pop popcorn! A large magnetron with a special history is shown in Figure 8. FIGURE 8. 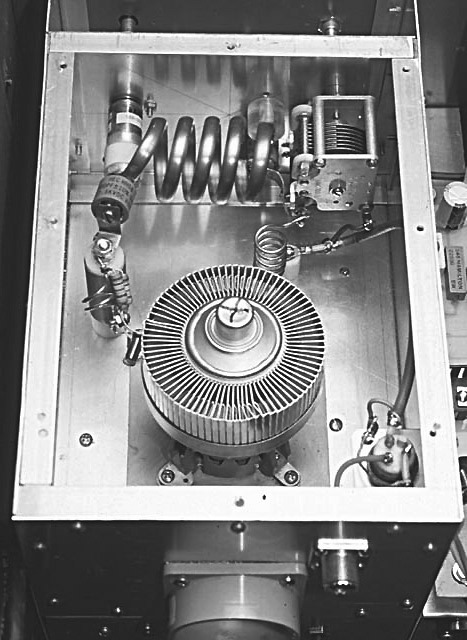 On display at the station of W5ZN, this magnetron was used to make some of the first amateur radio Earth-Moon-Earth (EME or “moonbounce”) contacts on the 2.3 GHz band in 1970 between W4HHK and W3GKP. The permanent magnets are the gray assemblies around the red vacuum tube portion of the magnetron. RF output came out of the white assembly at the top. Several hundred watts of microwave (UHF, technically) power in 1970 was quite an achievement! What is the Tube’s Future? That is an excellent question! Although I don’t think digital signal processing (DSP) and software defined radio (SDR) are going to be able to generate much high power RF, big transistors with integrated protection circuits are rapidly taking over niches previously filled by tubes. Don’t let your reach exceed your grasp. High voltage is not for beginners. Working with high voltages requires the maturity and patience that comes with age and experience. If you are a young builder, work with an experienced mentor. Never work around high voltage when you are tired, stressed, or in a hurry. Never work around high voltage after drinking alcohol. Even one beer or glass of wine can impair your judgment and make you careless. Before working on a high voltage power supply, always follow these three steps: Unplug the AC power cord; discharge any energy storage or filter capacitors; and verify that the voltage is truly zero. A time-honored practice is to use a “chicken stick” (a wooden dowel or PVC tube, with one end attached to a grounded wire) to make sure filter capacitors are completely discharged. When working on a high voltage power supply, remember that a dangerous time is after the power supply has just been turned off, but before the filter capacitors have fully discharged. A 50 µF capacitor charged to 4,000V holds a potentially deadly 400 joules of energy. Even with bleeder resistors, it can take a minute or more to discharge fully. When removing a recently discharged filter capacitor from a power supply, tie the two terminals together with wire. Large high voltage capacitors can self-charge to dangerous levels if the terminals are left floating. Don’t stake your life on the expectation that bleeder resistors, fuses, circuit breakers, relays, and switches are always going to do their job. Even though modern components are very reliable, it is safe practice always to assume the worst. Don’t build high voltage circuits if you don’t understand how the circuit works. 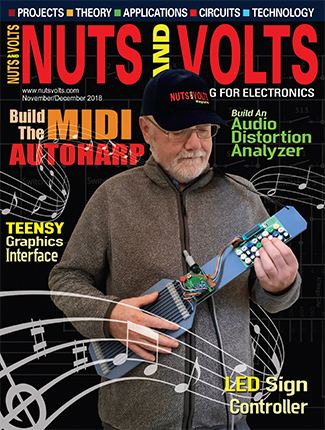 High power amplifiers and power supplies are not “plug-and-play” projects with step-by-step instructions. Builders must be knowledgeable enough to improvise, make component substitutions, and implement design changes. With high voltage projects, it doesn’t pay to be “penny wise and pound foolish.” Use high quality components throughout.